In November, Denver was named Colorado’s first solar-friendly community, thanks in part to the work of two Swarthmore alumnae. “It was definitely Denver’s day in the sun,” says Jessica Scott ’00. 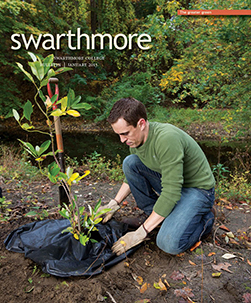 An even bigger surprise came earlier in the month when Scott and her collaborator of nearly a year, Rebecca Cantwell ’75, discovered their common Swarthmore roots while reading each other’s bios on a program for a panel on which they were featured. “In the Rocky Mountain area, you don’t run into Swatties very often,” says Scott, who also serves on the Swarthmore Sustainability Committee. Cantwell echoes that sentiment. “I believe I was the only person from Colorado when I was [a Swarthmore student],” she says. Cantwell majored in religion at Swarthmore, then worked as a journalist in in Denver for decades before turning to renewable-energy advocacy. She now edits and publishes Smart Energy Living, an online resource. Scott studied biology and environmental studies at the College. The pairing of these two alumnae, both heavily invested in sustainability, was indeed a fortuitous one. 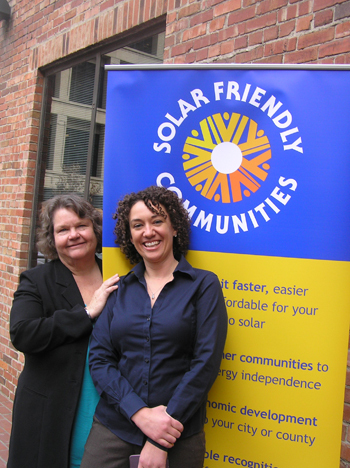 In February 2012, Scott and Cantwell were brought together by the Solar Friendly Communities program, which is currently operating only in Colorado but may be adopted in other states. Cantwell is the program’s director, and Scott, the solar program coordinator for Denver Mayor Michael Hancock’s Office of Sustainability, serves on the steering committee. Colorado’s program is one of 22 Rooftop Solar Challenge efforts happening across the country, thanks to a grant from the U.S. Department of Energy. Denver’s success has much to do with a set of 12 best practices, created by Cantwell and Scott, that aim to reduce the “soft costs” associated with solar installation by capping permit prices, limiting inspection requirements, and speeding up the permit acquisition process. Now, says Scott, a Denverite can walk into city hall with $50 and walk out with a permit for solar-panel installation 15 minutes later; elsewhere in the state, wait times are up to 20 days, and permits cost roughly $500. Scott says that streamlining permit approvals across the region would be a boon for area solar installers, who otherwise are faced with policies and procedures that differ from town to town as a result of the state’s home-rule principle, which grants governmental autonomy to each municipality. Denver’s status as a Solar Friendly Community is just the beginning for Scott and Cantwell, who continue to collaborate to educate homeowners and officials and perpetuate the Solar Friendly Communities designation.